Brad Zakarin speaks to students, faculty and staff at a forum on the recently released Undergraduate Residential Experience Committee report. Many students raised concerns about the elimination of residential colleges and permanently themed houses in the proposed framework. At the first forum to collect feedback on the Undergraduate Residential Experience Committee report, released earlier this month, many residential college members expressed their concern about the new housing framework proposed in the report. The report recommends a new model that would replace the currently existing residential colleges, communities and halls with a universal structure of “houses” within “neighborhoods.” One of the points most contested by students was the suggestion that these new houses eliminate the permanent themes of the residential colleges — themes which Chapin Hall resident Ava Serra said provide comfort for incoming freshmen looking for community. About 40 people attended the forum Tuesday in Allison Dining Hall. After committee member Brad Zakarin, the director of Residential Academic Initiatives, gave an overview of the report’s main recommendations, the floor was opened up for a moderated discussion. 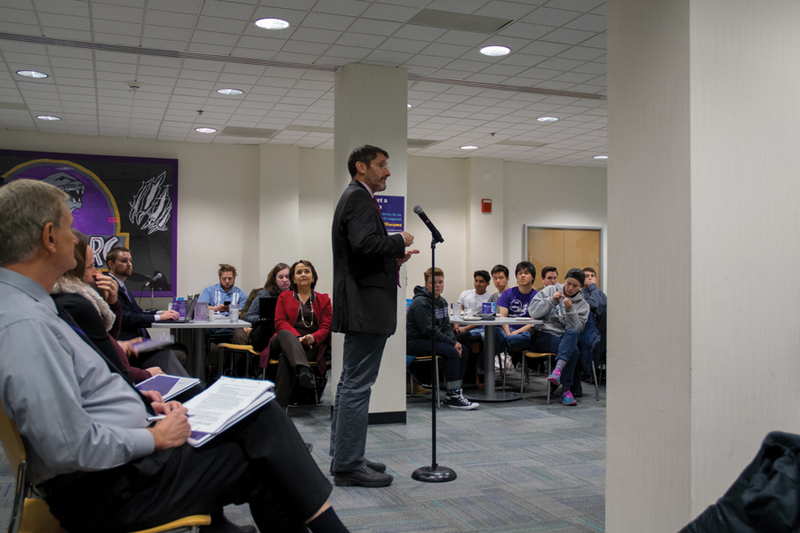 The main critiques were raised by students and faculty from residential colleges, many of whom expressed concern that the new model would abolish the residential college system as it currently stands. Still, Serra — who said her Chapin community was one of the main reasons she stayed at Northwestern when she considered transferring to another school — emphasized that the fixed framework can facilitate connections between students who otherwise have different backgrounds. Other concerns raised on Tuesday include the lack of designated housing for Multicultural Greek Council and National Panhellenic Council chapters in the report and the question of providing opportunities for off-campus students to maintain connections to their old homes — like “non-res” members who participate in residential colleges but do not live in the buildings. Committee members emphasized that many details of the report’s implementation have yet to be finalized, and that continued forums and “working groups” would allow for further student input. Committee member Mary Finn, the Associate Dean for Undergraduate Academic Affairs, also expressed concern that people were only coming to the forum to be “activists” for preserving the residential college system. She encouraged attendees to have “empathy” for the experiences of other students outside of residential colleges.